Space saving rack safely stores your hair dryer and curling iron. Keeps cords from tangling. Countertop stays neat. 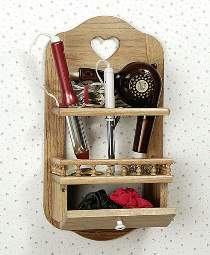 Handy lower door opens to store bobby pins, barrettes, etc. Pictured in oak. Plans drawn FULL SIZE. 22"H x 11-1/4"W. The #1376 Hair Care Center Hardware Parts Package includes 14 oak galley spindles, a ceramic knob, magnetic catch, stop hinges and hinge screws. Project plan, wood and finish are not included.